As a beginner woodworker that likes to mainly do projects on the weekend, I debated whether a router table would be worth the investment. After doing several hours of research, I found out that router tables are good for both beginners and experts, so I started looking at different brands. What I found out was that the Kreg Router Table is one of the most dependable brands on the market, and the router table I ended up buying proves that. I purchased the Kreg PRS1045 Router Table and after using it a few times, I couldn’t wait to go online and tell you about it. This table is one of the sturdiest that I’ve ever experienced, and it comes with so many accessories that you really don’t need anything else to go with it, except for your router of course. I haven’t found a woodworking project yet that it can’t handle, and it makes my projects even more fun. I couldn’t be more pleased with my purchase so far, and I’ll tell you why! Why the Kreg PRS1045 Router Table is So Good ? Who Should Buy This Router Table ? The first thing that you’ll notice when you open the box is all of the accessories that you’re getting with the purchase. In addition to the table, you also get the PRS3090 Caster, the PRS3020 True-Flex, the PRS3100 Router Table Switch, the PRS3400 Set-Up Bars and the PRS7850 Router Table Stop. At first I thought all of the accessories were a little too much for the small projects that I do, but I quickly realized that they actually make it a perfect table. I will say that the assembly took me a very long time, and it wasn’t the easiest thing to put together, but it was worth the effort. I can only imagine how much a professional woodworker would like this router table because it just doesn’t seem like there’s anything it can’t do! What I like most about this router table is the adjustable T-square style fence. It is made of a durable high-grade aluminum, so it can handle a little abuse. Once you get the hang of how to adjust it, you can literally adjust the fence with just one hand. And it’s just as easy to remove as it is to lock securely in place if you’re ever working on a smaller project that doesn’t require the fence. Aside from the incredible durability of the tabletop, I also really enjoy the dust collection port that the Kreg PRS1045 Router Table has. It attracts most of the dust that’s created when you’re doing your cutting, which means you won’t have to clean up as much when you’re done. With a tabletop that’s 24” x 32”, you will most certainly have plenty of projects that will generate a lot of dust, so the built-in dust collection port is one of the most underrated features of this router table, in my opinion. I really don’t think there are many router tables that compare to this one. When you look at the overall quality of the construction combined with the additional features and attachments that it has, I’ve never seen one like it. There may be some tables that are just as durable, but the features aren’t quite the same. I’ve seen and used plenty of other router tables, but the fence is by far the best that I’ve ever used. You’re going to pay a little more for the Kreg PRS1045 Router Table, but you also won’t have to buy anything else to go with it. 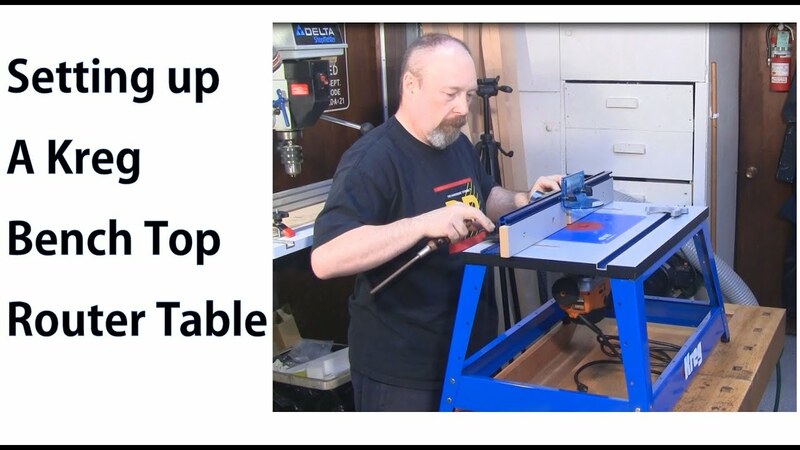 A lot of other router tables can have the same types of features, but you will have to buy them separately. When you look at it that way, the value of this router table is unmatched. I would say anyone who wants to learn or already knows how to use a router and router table should buy this product. If you’re a professional and don’t have this table, then you’ve been missing out. If you’re a beginner who has never used a router table before, then you might as well buy this one as your first one, because you will eventually want to upgrade to it anyway. Whether you know what you’re doing or want to learn as you practice, the Kreg PRS1045 Router Table will suit you just fine. There aren’t too many negative things to say about this router table. However, I would have to agree with a lot of the reviews that I read that it is not the easiest to assemble. You will have to set aside at least a couple hours if you want to assemble the table properly the first time. You’ll probably get frustrated like I did, but you have to refrain from rushing it, since it will only make it worse. The most difficult part is drilling the holes perfectly to ensure that it fits the router you have. But it’s great that it allows you to drill the holes to fit your router, so you won’t have to go out and buy a new router just to fit the table. Unless you are on a very tight budget and just want a simple router table without a lot of features, then you should definitely buy the Kreg PRS1045 Router Table. Even if you don’t think you will use all of the features that it offers right away, just think about the projects that you might do later on. Once you buy this router table, you’ll never have to buy another one for a very long time. It is strong enough to last many years and you likely won’t have to buy any other attachments to complete a variety of projects. In my opinion, you shouldn’t wait any longer and buy this router table so you can get started working more efficiently and you can have a setup that you’ll be proud of! However, if this router table is a little bit out of your budget, then have no fear. You can get the same quality with the Kreg PRS2100 Bench Top Router Table. It doesn’t have quite as many features or accessories, but you are still getting a quality table with the Kreg Router Table brand name.